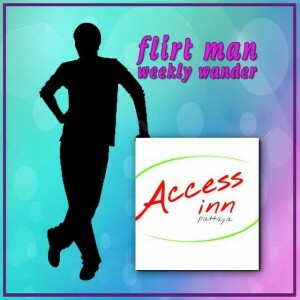 Our Weekly Wander is a strange affair this week as FlirtMan was summoned to attend the Tfi event at The Access inn (3rd rd). This event was entitled “Top Of The Pops” and as you could guess, involved DJ Brooksy & Goldfinger playing all the number 1 hits from the past UK Charts. Before i get to the party goings-on it is probably best to tell a little information about The Access Inn itself. It’s a bit unfair to simply list this place as a boutique hotel as it’s quite a bit more besides. On the bottom floor there is a great outside patio restaurant area serving very high quality food but at surprisingly low end prices and in the evening they have a large nightclub space complete with pool tables, soft sofa area and dance floor. This TFI night was a charity night in aid of operation smile and kudos go out to the sponsors namely : The Vineyard, Compass, Defence International Security Services, Homesdirect & CEA. For the small sum of 400baht you got free-flow beer, wine & soft drinks from 7pm to 10pm. Simply an alcoholics dream ! At this point your probably guessing that all the patrons were on drinking overdrive and tried to consume as much as possible in the time allotted….but you’d be wrong. So much so that the free-flow was extended to midnight as the onus was definitely more on having a great time for charity rather than pickling one’s liver in a binge drinking session. As the night progressed the dance floor was swamped by dancing bodies bopping away to such tunes as “come on eileen” and strange offerings by Rene & Renato…google that one if you’re not old enough. It turned out such a success that even the owner ended up on a podium gyrating to the tunes ! Internally the Access had juggled the furnishings somewhat and they now have a new DJ box in a more central area overlooking a wide dance floor and there was enough standing and sitting areas to keep everybody happy…with a few oldies sitting outside as the beats were probably too noisy for them. I should end this wander by saying that it’s a better plan to watch the video that Flirt-Pattaya produced as pictures tells a thousand words and the vibe of the night will be conveyed much better. As for the Access inn, it really is a gem hidden along 3rd Rd and they have special wine evenings as well as a few good looking ladies on hand to give some eye candy. It’s an downstairs area that can be constantly evolving and caters for thai and foreigners alike in the nightlife department and was perfect for this type of gig. You’d be hard pushed to think of a more apt space and location. Join me again next week when i check out some of the beer bar complexes around the soi buakhao area….let’s see if there is any “action” in action st.